George Zimmerman is back—personal arsenal and all. After being cleared of all charges in a domestic-assault incident, in which his girlfriend insisted that she was misinterpreted by the police, Zimmerman was free to pick up his confiscated guns, which he did on Wednesday from the Seminole County sheriff’s office. He then accompanied his girlfriend, Samantha Scheibe, to pick up her own guns, which were also confiscated during the case, the New York Daily News reports. The mini arsenal included a .380-caliber handgun, a 9-mm handgun, a Glock 19 handgun, a Kel-Tec 12-gauge shot gun and an AR-15 assault-style rifle. According to the Raw Story, while picking up Schiebe’s weapons on Thursday, they were approached by a videographer, though they declined to answer any of the questions about their relationship and his new painting, which is up for bidding on eBay and has already passed the six-digit mark. Zimmerman took to Twitter to complain about the videographer, accusing the freelancer of harassing him. 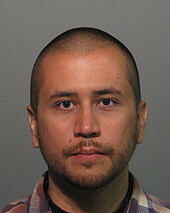 Read More George Zimmerman Gets Back 5 Guns Confiscated During Domestic-Assault Case – The Root. This entry was posted in News from the Soul Brother and tagged AR-15, domestic violence, George Zimmerman, Glock, guns, Kel-Tec, Shooting of Trayvon Martin. Bookmark the permalink. What with so many people wanting to take revenge on Zimmerman I fully understand why he might have some guns. If any of those try to take him out I certainly hope he knows how to use those guns.